Port Gangavaram in Andhra Pradesh, India has started commercial operations, though official declaration of inauguration of the port is expected anytime. First commercial vessel M.V.Timios Stavros was berthed on August 03. The second commercial vessel M.V.Ikan Sembak with 53,970 tonnes of non-coking coal from Indonesia was berthed on August 04 to avoid demurrage charges at the congested Visakhapatnam Port. the Greenfield port is operated by Gangavaram Port Limited and is developed as a Public-Private Partnership model by the State Government of Andhra Pradesh and consortium led by Mr.D.V.S.Raju. being developed as all weather, deepwater, multi-purpose world-class port facility to handle up to 300,000 DWT vessels with 29 berths, in phases over a period of 50 years. 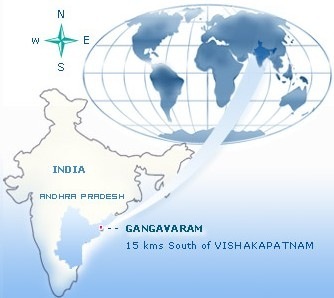 located in East Coast of India about 15 kms south of Visakhapatnam Port. railway connectivity is being provided to connect the port to national network of “Chennai-Visakhapatnam-Howrah” rail corridor. as part of phase 1 development one Iron Ore berth, one Coal berth and three Multipurpose berths are ready with 19.5 metres depth in harbor below CD. over INR 2,000 crore has been invested in the project so far. Anyone looking for jobs in the port, may get the details here. Photographs of the port and first,second vessels visited are available here. For more details on Port Gangavaram, log on to Gangavaram Port Limited. The formal inauguration of Port Gangavaram is expected to take place this month. The East Coast Railway (ECoR) has completed construction of 3.8 km long railway line connecting the port’s railway exchange yard with its own trunk route network and has started operations in the port from end September. Read more from The Hindu-Business Line.